We are pleased to inform you that both Tirumala and Tirupati Shri Kashi Math branches are now ready to fulfill the needs of GSB pilgrims visiting the holy abode of Tirumala Sri Venkataramana, the Lord of seven hills . The renovation work at Tirumala branch math is complete and the services are already being best used by devotees. 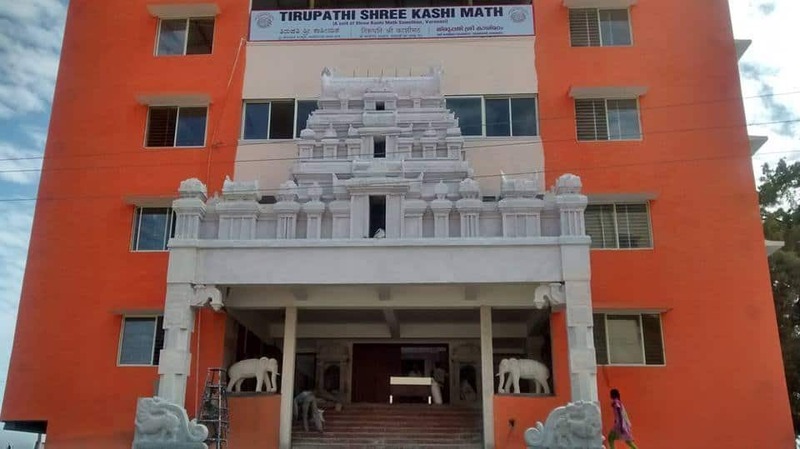 The recently inaugurated Tirupati branch math with a temple of Sri- Bhoo Sahitha Lord Venkataramana is now ready to meet the needs of visiting pilgrims. It houses a guest house, which has a total of 34 rooms including 9 air-conditioned rooms. Devotees are requested to contact the following numbers for pilgrim amenities in advance and make it a pious memorable pilgrimage experience. Me and my wife have tentatively planned to visit December 2 & 3 December 2017. May we get a room to stay. We require rooms for 12 nos on 28th april 2018. it it available at thirumala. please help. Dear Sir, we require accommodation coming on 10.4.218. We request you to kindly send your tariff. Waiting for your kindly reply. We need an accommodation for 4 people on 18th July 2018 (morning). Kindly let us know if it can be made available on the day of visit. We will be there on evening 22 to morning 24 july. This will b our first tour to forums and tirupati. Can I have to stay there with my wife and a 6 year child. Reply pls. Kindly accomodate for a day. we require one room accomodation for 2 persons on 01-12-2018. Kindly confirm availability with details. We will be visiting Tiruputi on 28th Dec 18 for Darshan. Would be obliged if you can allocate two rooms to us at Tirumala or Tirupati. We require accommodation for 4 members on 1-12-2018 or 2-12-2018. Please kindly confirm availability details in your math in tirumala..
We need an accommodation for 4 people on 22nd Jan 2019 (morning). Kindly let us know if it can be made available on the day of visit. We as a family visiting tirumala on 6th of April 2019. It would be great if you could let us know if there is rooms available and the cost per night stay. Hello Sir. We are a family of 5 members and need rooms for the dates of 31st March 2019 to 3rd April 2019 till 11 am. Can you please help us with the same at the best possible way from your side. Hello Sir. We are a family of 5 members and need rooms for the dates of 31st March 2019 to 3rd April 2019 till 11 am at Tirumala Hills. Can you please help us with the same at the best possible way from your side. We are coming with family need room for 5 person in kashi math tirumala. on 4th and 5 the april 2019. pls give me detaols on my mail: [email protected] or mobile : 8888228222. Hello Sir, We require 1 day stay at Tirumala on Apr 18 2019 and we have already booked Special entry Darshan for 18th April at 4 pm. Adults – 2, Kid -1.